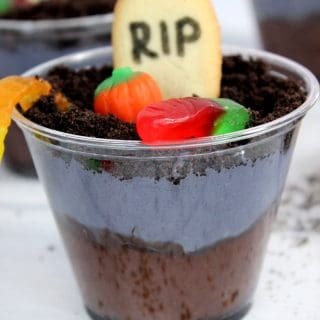 How cute are these Halloween Dirt Cups?! 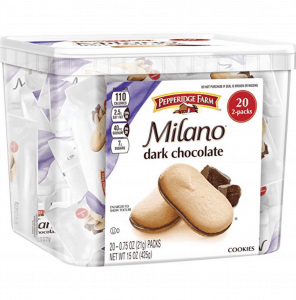 The grey layer has a secret ingredient that makes these taste BEYOND amazing! If you know me at all you know I love making themed food! 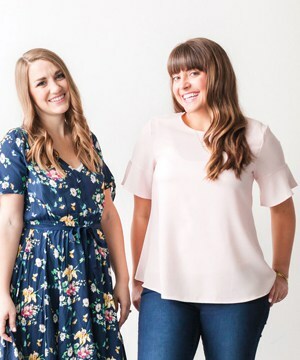 I love any excuse for a celebration, and my favorite way to celebrate is with food! 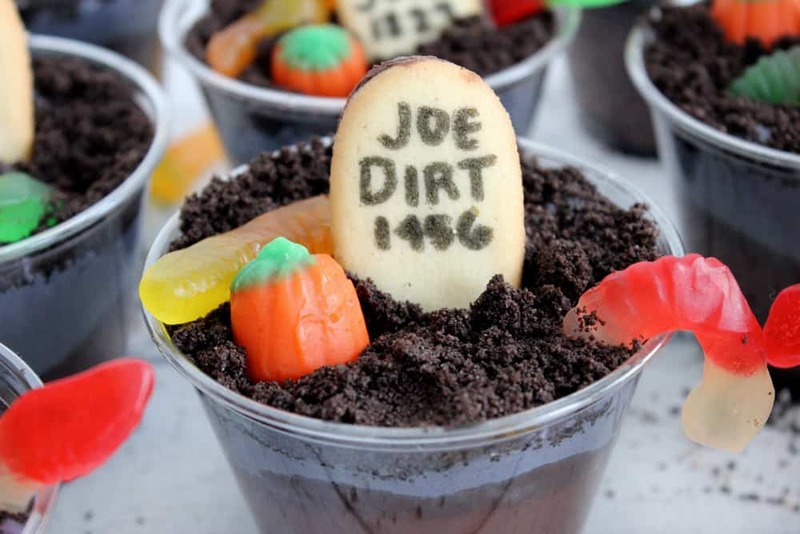 I made these adorable little dirt cups and my kids were OBSESSED with them to say the least! 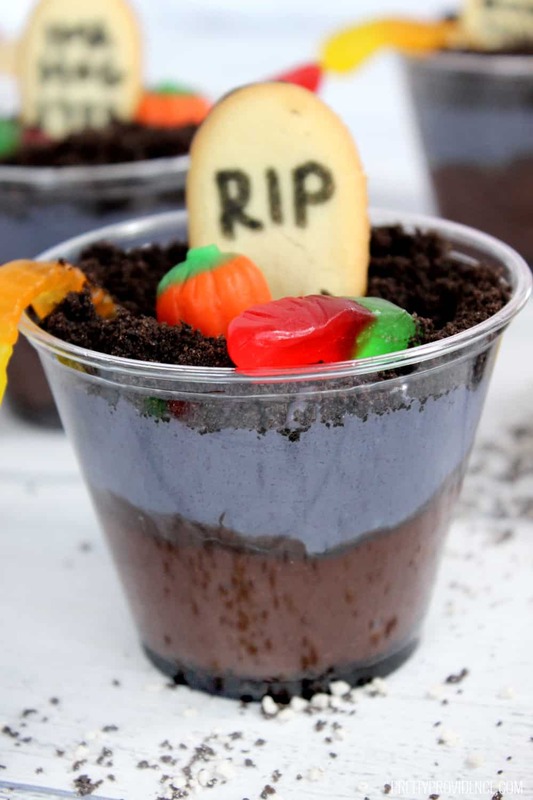 Most people think of dirt cups as pudding with cookie crumbs and gummy worms. 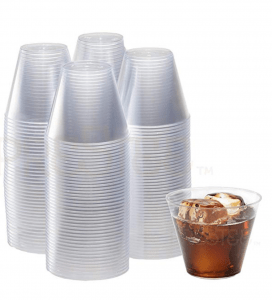 While those are yummy in and of itself, these kicked up dirt cups take things to the next level! The grey layer is pure HEAVEN, and everywhere I take them people beg me for the recipe! The kids had so much fun helping me come up with names and dates to put on the adorable little tombstone cookies! You ready for the fun and easy recipe? 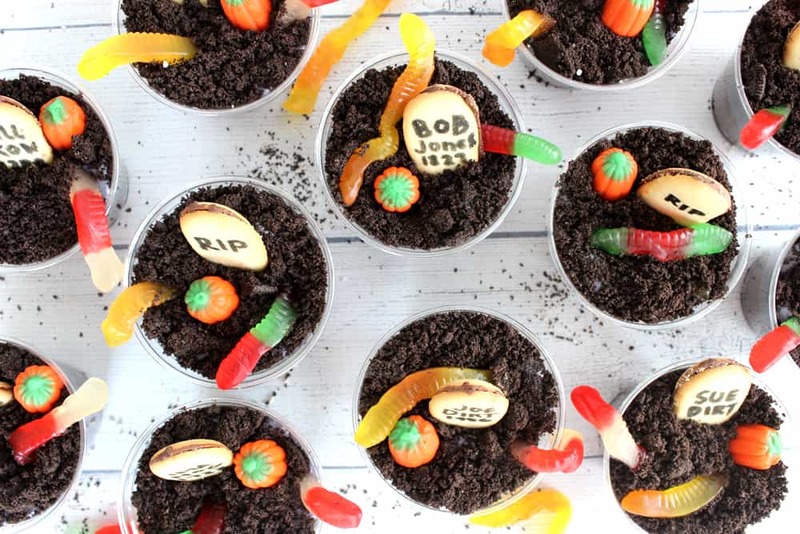 How dang cute are these easy Halloween Dirt Cups?! The grey layer has a secret ingredient that makes these taste BEYOND amazing! Mix your pudding box with milk and and set in the fridge to set. Process your Oreos in a food processor and set aside. In a separate bowl, combine sweetened condensed milk, cool whip and cream cheese and beat until smooth. Add a few drops of black food coloring to make a grey layer. Set out cups and put a scoop of Oreo crumb on the bottom of each. Then add a pudding layer, then a cream cheese layer, then more Oreo crumbs on top. 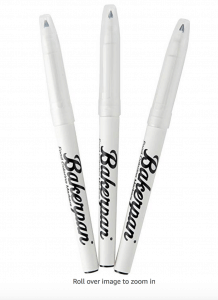 Write names and dates on your tombstone cookies and stick them in cups. 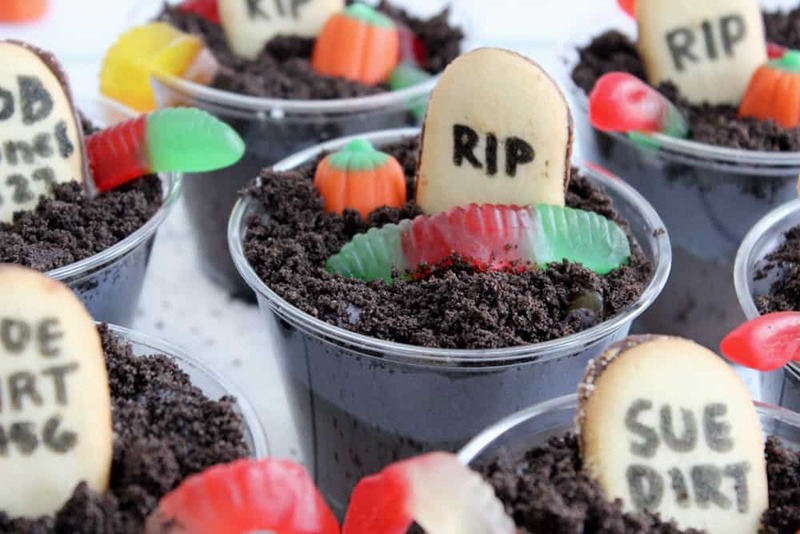 Garnish cups with gummy worms and candy corn pumpkins. Enjoy! Perfect for any Halloween party or gathering! I hope your little ones love these as much as mine did! Oh my, such an adorable idea!! My kids would love these!!! OMG such an adorable idea! My kids are going to love these! Sooo cute and so yummy!! these looks super fun! perfect for a halloween party!